The hero of your short story has found a way to summon the Weird Sisters of Macbeth fame to inquire after the future. Worried that the witches will try to trick your hero by giving a prophesy that can be favourably and plausibly read one way, but that also has an alternate, surprising and terrible interpretation that is consistent with the words of the prophesy, your hero finds a way to force the witches to speak in Lojban. Unfortunately for the hero of your story, a witch’s prophesy can backfire in unexpected ways that still respect the letter of the prophesy itself, even if it’s delivered in a language that’s syntactically unambiguous. This Friday past, I started learning Lojban. For the non-initiate, Lojban is a constructed language based on predicate logic that is syntactically unambiguous. I’d known about it for years, probably hearing about it first on CBC, maybe 10 years ago. It’s the sort of thing that shows up in Dinosaur Comics or in XKCD periodically. Up until this weekend, the existence of Lojban had mostly been one of those “cocktail party facts,” but then I finally took the plunge. After 1 weekend of working on it, I’m about 35% of the way through Lojban for Beginners, having downloaded it to my Kobo for reference during the car ride to Stratford. I’ve convinced a few people in Montréal to learn Lojban with me, and even found a Montrealer who speaks Lojban on a #lojban IRC channel. (Yes, IRC still exists!) We may “ckafi pinxe kansa,” as they say in Lojban, apparently. If you too want to get in on the ground floor of Lojban Montréal, let me know! Shortly after my little sister moved to Montréal, she was asking about how to use the word “celui” in French. Alain gave her an example. “You can say, ‘celui-là,’ which means ‘that one there,'” he told her. Everyone gather ’round. It’s that time again! It’s time for me to answer my readers’ questions! And by that, I mean, it’s time for me to see what strings of words people have typed into Google that brought them to my blog. Then I look through the search keywords that are (more-or-less) well-formed questions and answer them as best I can. It’s the least I could do, since they took the time to visit my site with these questions on their mind. Mostly because it’s not an airplane. Those booster rockets that the space shuttle normally uses for take-off are not decorative. Begin a chess game with a friend, castle normally. “Rook” is the name for the pieces that start at the corners of the board. In chess, “castle” is a verb. It’s the verb that means to move your rook and king at the same time, two spaces toward each other, provided that the intervening spaces are not occupied and that neither the king nor rook has been moved before in the match (and that you’re not trying to castle out of check). Are you really asking me to help you to cheat on the MCAT? Get out. No. No one in the history of mankind. No one whose motives were so pure as to aspire to medical school has ever even considered cheating to attain such a goal. Actually, now that you mention it, grammar is the greatest joy in life. Sell bike, and buy Bixi pass with the proceeds. You gotta do it yourself, I’m afraid. You can get Acco-Press binders at the bookstore. That’s quite the predicament! Are you a Canadian citizen? Nope. No such thing. Once you’re 25, you pay full price, whether you’re a full-time student or not. Heh … Do you really want to know? Thank you for asking! Mostly crashing, interface glitches and the fact that there’s no separation between content, formatting, comments and meta-data. Bajor, if you want it authentic. But if you would make the brine for a really strong hasperat—I mean eye watering, tongue searing strong—you’d make an old man very happy. It’s the 144th birthday of our country, and to celebrate, here’s some grammar! The word “O” is not the same word. This will be easier to understand if you know a language that has cases, like Latin or Greek. In Greek, nouns, adjectives etc. can take one of five cases, although sometimes there’s ambiguity among them. The nominative case is used for the subject of a sentence. The genitive is used to express possession. The dative is used for indirect object. The accusative is used for direct objects. Finally (and most importantly for understanding the word “O”) the vocative case is used for directly addressing someone or something. “O” is a particle for introducing a classically styled address in the vocative case. You sometimes see this in religious texts in English: “Praise the Lord, O my soul!” So in this case the author is directly addressing his soul and telling it to praise the Lord. You should not use “O” to express surprise. Saying, “O hi there” would be incorrect. You should also not use “oh” as an address, which brings me to why this is important for all Canadians. The two words are homophones, like “you” vs “ewe”—different words, different spellings, same pronunciation. It’s “O Canada,” not “Oh Canada,” and there is a difference in meaning between them. Now that my thesis has been submitted, I’m reading a book for pleasure called The Witch Doctor’s Wife. It’s not a life-changing read or a very challenging one, but it’s a fun story, full of sarcastic pokes at historical political problems. It’s nice to have something light to read after mostly reading about moral theory, economic theory and human research protocols for a year. And of course, I found typos! They seem to have a hard time with homonyms. That’s all I’ve found for now, but I’m only on page 170 of 307. I haven’t even gotten to the murder promised on the back of the book. 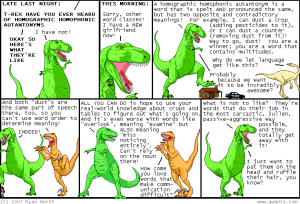 I first started thinking about this a while back when I saw a Dinosaur Comic on this subject. 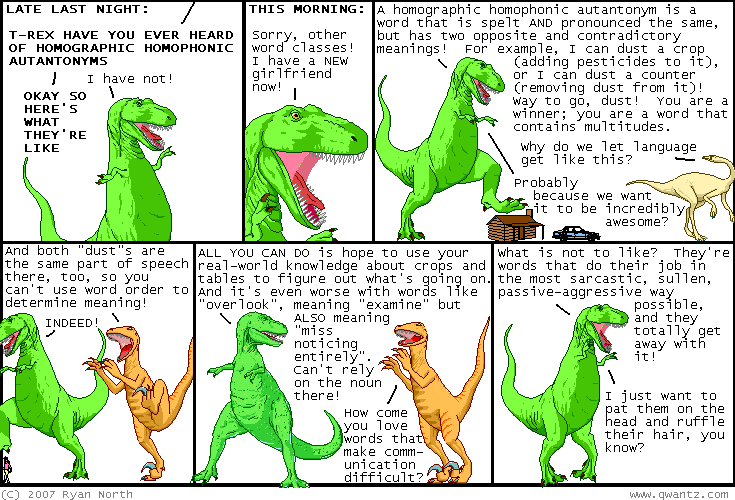 Homographic homophonic antonyms are words that are spelled the same and pronounced the same but have opposite meanings. The example in the attached comic is “dust,” but a quick Google search reveals others like “weather,” (enduring something or eroding something). I’ve found that most of the examples are kind of contrived, though. “Out”—as in “the stars are out” vs “turn out the lights”—I guess, but that’s kind of stretching it. “Fast”—as in “to run fast” vs “to hold fast”—ehh … I guess. I think the reason I don’t like these is because they’re different parts of speech. I thought of one this week that works pretty well, although I’m not sure if it counts, since it’s two words—”lucked out.” I’ve heard it used to mean both experiencing something fortunate or something unfortunate. Here’s my question: If it is incorrect to pluralise “octopus” as “octopi,” then why is it okay to pluralise “hippopotamus” as “hippopotami?” The OED says that this is an acceptable plural. The word “hippopotamus” is also Greek in origin. It comes from “hippos ho potamios.” In Greek, “hippos” means “horse,” and “potamos” means “river.” The plural of “hippos” is “hippoi,” as I recall. A few weeks ago I found a typo in The Silver Chair by C. S. Lewis. This was shocking, to say the least. So, of course, I went looking for some more. I found one in The Last Battle. Before I point out the typo that I found, I should clarify the distinction between a few different kinds of typographical marks. Specifically, I will be speaking about hyphens, en dashes and em dashes. Hyphens are used to join two words together or separate syllables of a single word. Hyphens are what you use for compound modifiers, like “well-respected,” or for other compound words, like “being-in-the-world,” if you were talking about phenomenology. An hyphen is the mark that you get on a Mac when you press the button that has a horizontal line on it. It’s beside the button that has the “equals” and “addition” signs on it (if you use a QWERTY keyboard). En dashes are probably less familiar to you than hyphens. An en dash is what you see in a range of numbers or to contrast values. For example, if you wanted to write “see pages one to twenty-one,” but using numerals instead of words, you could write “see pages 1–21.” You’ll note that the en dash is slightly longer than the hyphen. You get the en dash on a Mac when you hold down the option key and press the same key as the hyphen. An em dash is used to indicate a break in thought or an explanation or to introduce an interpolating thought with a break that is even stronger than parentheses. It is also used to indicate that a speaker was interrupted. The em dash is even longer than the en dash. You can type an em dash on a Mac when you press and hold the shift and option keys while pressing the same key as the hyphen or en dash. What does this have to do with The Last Battle? Look at the typographical mark between “Marsh” and “wiggle” in the scanned page from The Last Battle. It’s an em dash. It’s way too long to be an hyphen. In fact, there’s an hyphen at the end of the line, in the middle of “disenchanted” for comparison. Hyphens are used for compound words, like Marsh-wiggle. Em dashes are used for something completely different. If you own another edition of The Last Battle, can you find this typo in your copy? I’m reading from the 1995 Scholastic reprint.